It is easy to provide nectar for hungry hummingbirds, but it is equally easy to make mistakes with that nectar that can jeopardize the birds. At the very least, a minor mistake might discourage hummingbirds from visiting, but major errors could create toxic, dangerous nectar that may be fatal to the hummingbirds that sample it. 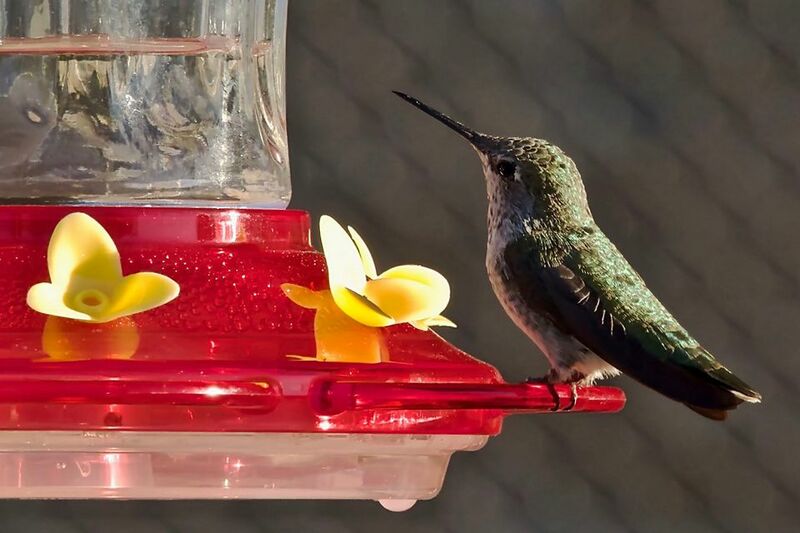 Review this list of hummingbird nectar mistakes to ensure you are offering your hummers the best, most nutritious, safest food sources possible. The classic hummingbird nectar recipe is easy to make and can be adjusted slightly, but using grossly incorrect sugar-to-water proportions be problematic. Overly weak nectar may not attract hummingbirds, and overly strong nectar can ferment more quickly and clog feeders more easily. Using sweeteners other than plain sugar or opting for sugar substitutes can also make the nectar worthless or even dangerous to hummingbirds. The best time to start feeding hummingbirds depends on many factors, including local climates, weather conditions, and when hummingbirds migrate. Learn the best months to feed hummingbirds and get those feeders out early so the first migrants can take advantage of them before spring flowers are blooming. Keeping the feeders available late in the fall is also useful so all migrants can refuel as they head south. A dirty feeder with contaminated nectar can be toxic to hummingbirds. Cloudy, milky nectar or nectar that shows visible dark specks or floating insects is dangerous and should be promptly discarded. Feeders should be cleaned and sterilized regularly so they are safe for hummingbirds to use. Hummingbirds can be very territorial about food sources, and aggressive hummingbirds will chase away competitors, denying them a chance to eat. Adding more hummingbird feeders or putting more space between feeders can help minimize aggression and accommodate more hummers. It's also easy to make a hummingbird feeder from a jar to offer an extra feeding station. Sugar water is attractive not only to hummingbirds, but also to ants, wasps, bees, hornets, and other insects. While hummingbirds can feed around the insects, a feeder that is crowded with insects becomes dirty and contaminated more quickly, and a large concentration of stinging insects can be dangerous for hummingbirds. Using several techniques to control insects, such as moats, feeder placement, and feeder color, will help minimize bothersome bugs. While supplemental feeders are a great way to offer nectar to hummingbirds, adding flowers that attract hummingbirds to your yard and garden is another way to feed these voracious birds with a free, natural food source that will continually replenish itself with new blooms. Opt for flowers that attract hummingbirds with the best colors and shapes, and more birds will sate their appetites in your yard. Feeding hummingbirds in very early spring or very late fall carries the risk that the nectar may freeze, as may any nectar kept available for overwintering hummingbirds in cooler regions. Frozen nectar is no help to hungry hummers, and other natural food sources may already be depleted, so it is essential to ensure the birds can actually drink the food that is offered by keeping it from freezing. While hummingbirds are nectivorous and depend on nectar for a majority of their diet, they need more nutrition than the quick energy sugar water provides. Other food sources such as insects, spiders, and pollen are essential for hummingbird diets, and providing those foods in your yard will ensure healthy hummers that get the proper nutrition for healthy growth and energetic lives. Hummingbirds are attracted to the color red, but most hummingbird feeders already include red parts and it is not necessary to add red dye to nectar in order to tempt the birds. With such small bodies, nectar-rich diets, and extraordinarily high metabolism, it is possible, though not yet scientifically verified, that dyes could be detrimental to hummingbirds, so why take the chance? While feeding birds is a great way to attract them to your yard, if you want the birds to stay around for more than a quick snack it is essential to meet their other basic needs for water, shelter, and nesting sites. 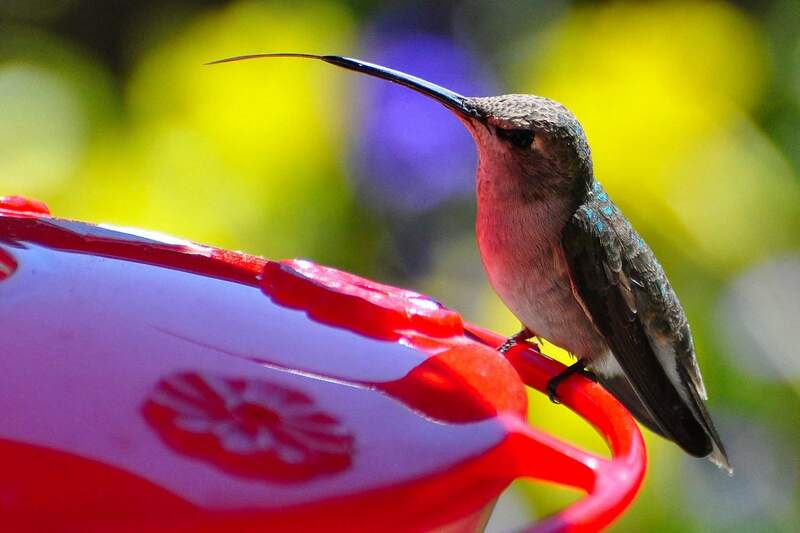 Providing water to hummingbirds is easy with a shallow dish, mister, or dripper, and choosing the best trees for birds will give hummers safe shelter and places to nest. Adding perches for hummingbirds and taking steps to attract nesting hummingbirds will also make your yard more hummer-friendly.